The curse of Gopal Krishna Gokhale lives on. It’s been decades since he said “What Bengal thinks today, India thinks tomorrow.” Since then all kinds of industry from jute mills to tea gardens to Nano plants have packed up and left the state. But Bengalis kept thinking. Meanwhile the state kept sliding backwards. The more the state slid, the more Bengalis thought. But now finally the Age of Mamata has dawned. It is time for action. It’s time for ekla chalo re. The indefatigable Didi has had enough. She has, all on her own, come up with a brilliant idea to make the state first class first again. West Bengal will drop its West and immediately miraculously hop skip and jump from 30 in the alphabetical order of Indian states to number 4. Didi will no longer have to wait for every other CM to speak before making her presentation. The Bengal contingent will not have to wait for every other state to pass by in the Republic Day parade before they can impress the President with vague Tagore dance moves in white saris with red borders. The West will be won. The West will be conquered. In a way it already has. Newspapers like The Telegraph have long referred to the state as just Bengal. Mamata’s government doles out Banga-samman or Pride of Bengal awards. The West has long been left by the wayside. It’s time to make it official. However our Didi is not greedy. As Rajyasree Sen points out in NewsLaundry, “She could well have renamed West Bengal as Aahamori (which means Dear One) and pushed the state to the absolute top of the state pile, but she didn’t.” But no, she has graciously let Andhra and Assam and Arunachal go ahead. 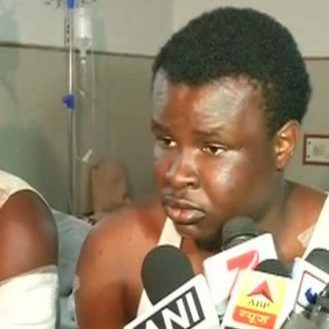 This, fellow Indians, is no mean sacrifice in a country where the name is the shortcut to getting ahead. That is why parents all over India are constantly saddling their children with AA-names. Aaradhya. Aarav. Aarna. Aadi. We are an A-plus culture. Bengal is happy to be B-plus, at least for now. 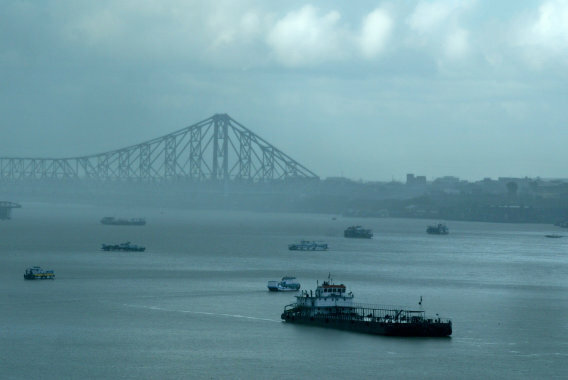 A passenger boat moves along the Hooghly river after passing under the Howrah bridge during a monsoon shower in Kolkata. The proposed name change makes perfect logical sense. We are a West Bengal in the east of the country. There is no East Bengal to our West Bengal except on the football fields of the Maidan. East Punjab became just Punjab in 1950. The national anthem already refers to Dravida Utkal Banga. And best of all the rest of India calls Bengalis Bongs for short already. Now we can become the Bongs of Bongo. We could have the Bongo-players of Bongo-land Band. The possibilities are mind-bongling. It has a nursery rhyme Abol Tabol flourish to it. And yet, Delhi keeps throwing a spanner in the Bengali march to Number 4. When Jyoti Basu had initially proposed a name change, the Atal Behari Vajpayee government had nixed it. Mamata had one misguided moment as well when she wanted to become Paschim Banga which would just moved us ahead of Punjab and Puducherry in the pecking order, which is really not much progress at all. 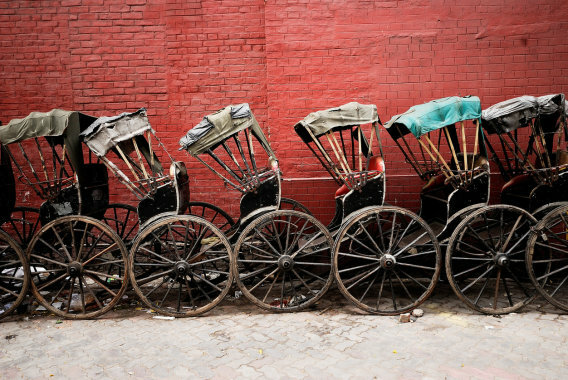 Hand pulled rickshaws against red wall in Kolkata. 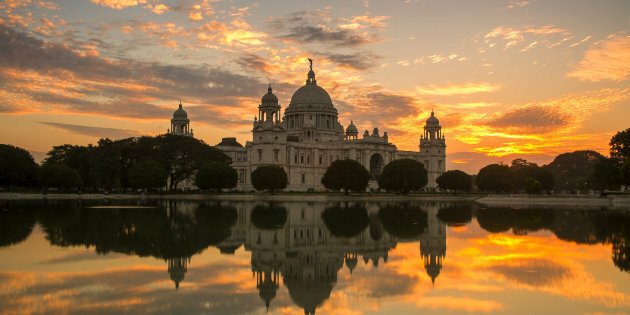 Apparently many feel that West Bengal preserves in its name the memory of Partition and they are loath to let that go. “The name has a lot of emotions attached to it and the people will not accept such a whimsical change,” says state BJP president Dilip Ghosh as if Mamata had decided to rename the state as Ma-Maati-Manushdesh. What Ghosh might or might not know is that long before there was West Bengal there was Banga. The Times of India reports that the first reference to Banga shows up in the Mahabharata. Raja Samudrasen of Banga was one of Draupadi’s suitors at the swayamvar. Of course, he lost. Yet another example of a Bengali snubbed. And who won? A man with an A-name. But we digress. The time has now come for the descendants of Raja Samudrasen to reclaim their inner Banga. Once we become Bengal our entire profile changes overnight. We will have at our disposal, simply by name association, the Bengal tiger, the Bay of Bengal, LA Times South Asia correspondent Shashank Bengali and last but not least the Bengal Club, where the rules of William Thackeray are still in force. 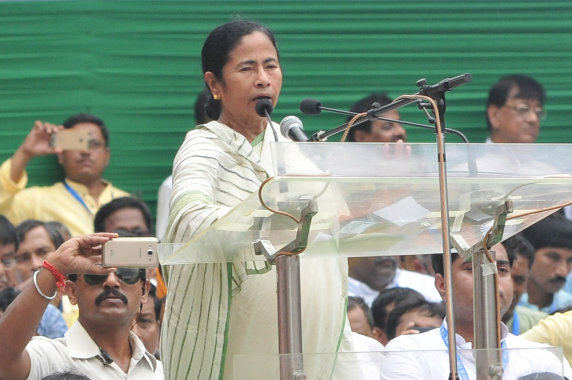 West Bengal chief minister and Trinamool Congress Party (TMC) chief, Mamata Banerjee addresses a mass meeting attended by hundreds of thousands of TMC supporters in Kolkata on July 21, 2016. Yes, there will be naysayers. We are a contrary people and the Automobile Association of Eastern India in West Bengal was a perfect example of our lives as a contradiction. A Twitter wag has noted that now Didi can have her bongo and play it too. BJP MP Babul Supriyo disapproves of Bongo for that very reason. It can be confused with a musical instrument that is played or bajao-ed, I say don’t worry, be happy. That’s a confusion that’s more than welcome in a state that prides itself on its knack for culture. And it’s better than being confused with Bangla, the country liquor. A little music embedded in our name itself soothes the savage beast. Mamata can declare it the state instrument. There will be some nostalgia of course. Bengalis are prone to nostalgia. It is the indigestion of our souls. They remember the jackfruit and mango trees of their grandparents orchard in Rajshahi and Comilla of the “other Bengal”. The West always reminds them of that phantom east and its lost orchards. In a state built on waves of refugees the West pointed back to a life left behind. Now only a football club will remind us of that history. But Didi is resolute. Didi is practical. Didi wants to move ahead and not be held back by the past. The centre will not give her the money she wants. At least it can give her the name.